MIRANDA is a very attractive, high-volume, easy-fleshing and broody daughter of S Nebraska 330N. She descends from one of MacDonald Ranches greatest cow families, being a great-great granddaughter of the prolific MAC Dolly 99D. Dolly remains in production at the age of 15 with 13 natural calves and 10 ET progeny in the registry, including 2 of the top-selling bulls in MacDonald Ranches 2008 sale. MIRANDA’s 1st calf dam is attractive and feminine with a well-designed udder and the fleshing ability and capacity typical of all cattle descending from the Dolly cow family. 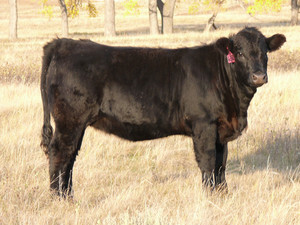 Her grandmother has an average weaning ratio of 104 on 3 calves and will qualify as an ASA Silver Dam in 2009.